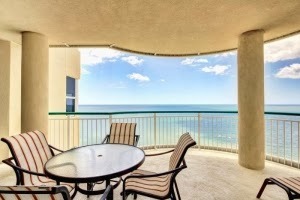 Enjoy this beachfront Perdido Key vacation home overlooking the Gulf of Mexico, this Beach Colony Condo located in beautiful Perdido Key Florida. Perched high above the beach, you will be delighted with the emerald waters of the North Gulf Coast and white-sand beaches. Lounge on your private balcony as you breathe in the salty sea air and listen to the seagulls and waves. Let these wonderful views and sounds be your wakeup call from the master bedroom. Take a relaxing soak in the whirlpool tub in the master bath as a soothing close to your day. Keep your fitness routine intact with a fierce game of tennis, a run down the coastline or a visit to the onsite fitness room for some cardio. Enjoy relaxing by the beachfront pool enjoying the warmth of the Florida sunshine or spend some time indoors at the pool and hot tub. Approx. 1,500 Square Feet. Bed Sizes: Master BR - King, 2nd BR - (2) Queens, 3 TVs, DVD Player, Granite Countertops, Stereo, Walk In Shower, Whirlpool Tub, Indoor Pool...etc., etc.